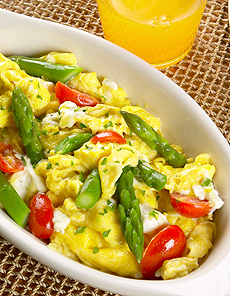 Start your day with a luscious plate of Asparagus Scramble With Herbed Cream Cheese & Tomatoes. Photo courtesy California Asparagus Commission. Try this scrambled egg recipe made richer, more elegant, and certainly more colorful! This is Page 3 of a 12-page article. Jump to the recipe below. Click the black links below to view the other pages. Blanch asparagus spears in medium pot of boiling salted water until just tender, about 4 minutes. Drain and set aside. Whisk eggs in large bowl. Season with salt and pepper. In a large skillet over medium heat, heat olive oil. Add eggs. Stir until eggs are almost set, about 1 minute. Add cheese in dollops and then add tomatoes. Stir until cheese melts and eggs are softly set, about 2 minutes. To serve, cut asparagus spears into 2-3-inch pieces and fold into egg mixture and place on heated plate or oval ovenware. Garnish with chopped parsley. Option: Serve an additional 2-3 spears of cooked asparagus on the side.